The good side of being an older brother is that any time there's a dispute you win. The bad side? Well, any time there's a dispute you tend to get in trouble for it: "He started it!" you say. "Yes but you're older and should know better." "I had it first," is your argument. "Sure" mom says, "but remember you're oldest and you should learn to share more." "I barely touched him!" "I bet," comes the skeptical reply "and even so, you're older so you're stronger." 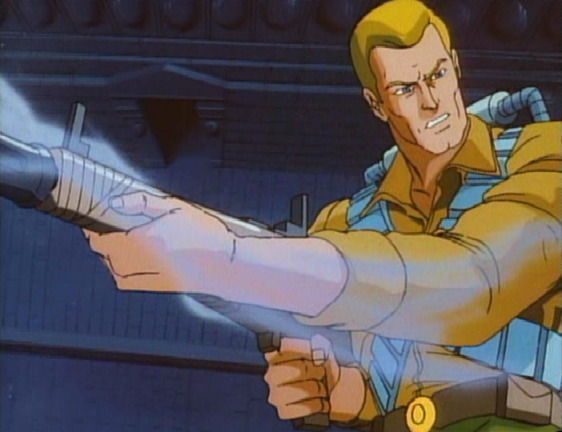 I won a single fight without a talking to as the oldest, and for that I'd like to thank GI Joe. I was around ten years old. As my younger brother Tim and I were playing, our younger sister, Becky, decided to follow. Presumably we were discussing something important. Probably some sort of high level, secret kid business that should Becky have discovered would have compromised sibling national security, or domestic tranquility. I don't know what our secrets were, but I'm sure President Bush would have understood the need for keeping our little sister in the dark. He probably would have done what we did too, which was to immediately run around the house to find somewhere away from her. The problem though was that little sisters catch on quick...and they can run too. After several laps, we hit upon a scheme to discourage pursuit. We'd borrow from the fighter jet scenes of GI Joe. Earlier we'd learned that the best way to win a dog fight was to fly directly into a cliff and pull up at the last second. Cobra's reactions were slower than those of the Joes. They wouldn't pull up in time and the maneuvers always resulted in a fiery crash of the Joe enemies followed by a chorus of heroic "YO JOE!" celebration. Minutes later, we were adopting the cliff maneuver. I ran directly towards a wall, and like Barry Sanders, juked away just in time. Tim did the same, although surely with a bit less grace. In another part of the house now, we knew our youngest sister was trying the maneuver. CRASH! Then came the yelps for a parental figure. Tim and I high-fived. We'd done it. Mom wasn't thrilled but our defense was rock solid. "We didn't touch her mom. In fact...we weren't even in the same room." She couldn't say a darn thing and we cleverly left out the part about our cartoon heroes so she wouldn't reconsider our tv-watching privileges. Like George Bush, we valiantly defended ourselves from a dangerous outside aggressor. And like our friends Duke, Roadblock, and Flint we were finally able to celebrate: Yo Joe!